Today I am taking a break from holiday cookie baking and sharing with you a fun recipe featuring Eagle Brand Sweetened Condensed Milk. 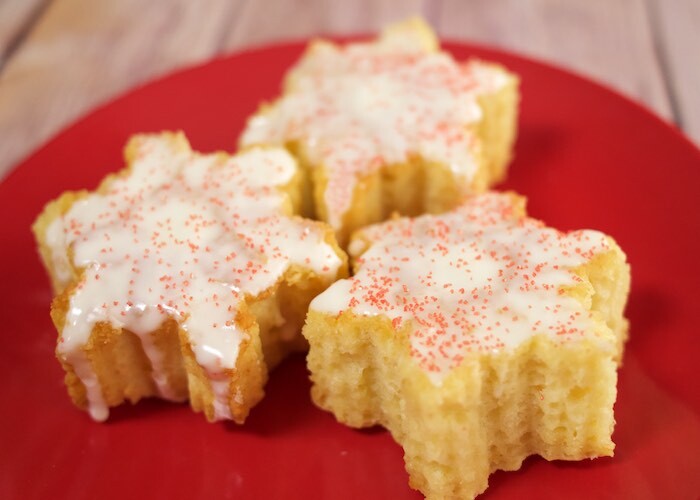 Don't worry if you don't have a fun snowflake silicone mold these moist mini pound cakes can also be made in your standard cupcake or mini cupcake pan. Preheat oven to 325 degrees. Prepare your pan whether it be the snowflake or the cupcake in. In a medium bowl whisk together flour, baking powder, and salt.Using a stand mixer fitted with a paddle attachment, cream together the butter and sugar on high speed until light and fluffy, about 3 minutes. Add eggs one at a time, mixing well after each addition. Add sweetened condensed milk, vanilla, and almond extract and mix to combine. Add dry ingredients, scraping down the sides of the bowl as you go. Pour batter into prepared pan. Bake 10-12 minutes (depending on the pan you decide to use) or until a toothpick inserted in middle comes out clean. Mix both ingredients together. You can add more of the sweetened condensed milk for a thinner glaze.